I missed a rock with my foot, sunk into knee-deep mud, popped back up, and yanked the boat behind me. 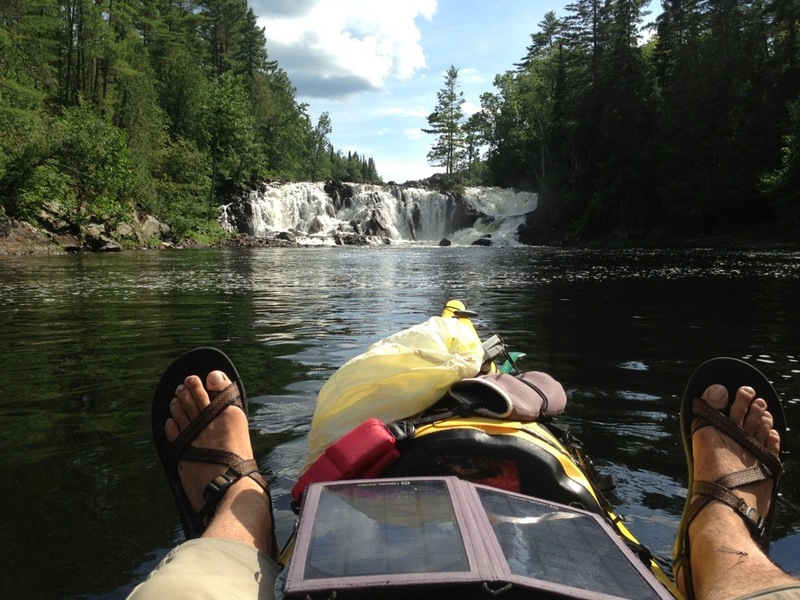 It sloshed forward and we were off again, sliding and scraping, crashing, over the last portage on the Mattawa. Covered in mud and sweat, soaked from hopping in and out of the boat, I splashed through water, slapped away branches, and charged down the portage path, legs churning, muscles pulling, trying not to stop, not to pause, not to think, but just to go like a runaway train, a ball of movement, an inevitable force. I hit the water on the far side and took off again, splashing aboard the Looksha down a twisting channel of lily pads that ended in a beaver dam stretched across the water. I saw it, thought for half a second, poured on steam, and charged. The hull hit the lip of sticks and mud and slid up it, slamming to a halt with me sitting on top of the dam, the bow hanging in the air, the back still in the water behind me. I sat still for a moment, then laughed and threw my weight forward, grabbing at sticks, pulling, taunting the beavers, feeling the weight of the boat shift. The bow swung down and dragged the boat crashing behind it and into the water on the far side. I grabbed the paddle and moved, rolling forward under storm clouds soaring into the heavens. The sun glowing over them, painting their edges golden as grey sheets dropped underneath and devoured the lake in front of me. The water boiled with heavy raindrops and I charged on, right into it, spinning the paddle in the air, until the the storm slipped past and away, dragging a pair of rainbows in its wake. I spun and watched them for a moment, the colors arcing across the sky, sharp against the grey canvas, then turned and paddled on, riding the momentum until loons called out, hollow and long, into the purple twilight. Posted in Angle to Key WestTagged Angle to Key West, momentum, portagesBookmark the permalink. Thank you D for painting such a wonderful and vivid picture of one of life’s moments to get my day going. Hope the solar-powered charger holds up ’til the end of the trip. Otherwise, I’ll be bummed without these wondrous updates. Daniel…one of the forces of nature…. Where did all that energy come from? Great writing — such vivid painting of vignettes in your day. Glad to know you are hearing the loons on your journey. hm, that’s exactly how they call, eh? Hollow and long. nice.